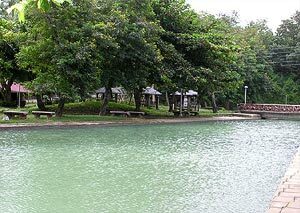 Siquijor hasn’t been featured yet here in Vista Pinas, so let’s rectify the situation by visiting the Capilay Spring Park, one of the famous tourist attractions on this mystical island province. This spring park is located in downtown San Juan, on the southwest coast of the island. Photo from the official Siquijor provincial government website. Capilay Spring Park is essentially a cold spring that has been converted into a sort-of public pool with a pleasing park surrounding the whole area. The pool is divided into three areas and the water eventually flows out (I think underground) into the sea, which is located nearby. According to some websites, the upper of the three areas is where the spring is located. The second area is the “swimming pool” and the last area is the “laundry” pool. I really like this place. Thank you for reminding me about the fun I’ve had in this mystical place.